What do you do when you've climbed to the top of a digital mountain? If you're Casey Neistat, you find a bigger mountain. 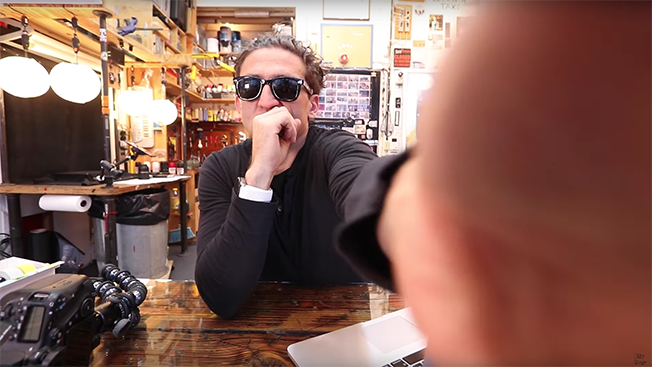 On Saturday morning, Neistat began his daily video with a sigh. The filmmaker and YouTube personality was ready to tell his 5 million subscribers that he was ready to end his daily video blog. Since it started 18 months ago, Neistat's channel has amassed more than 1 billion views, making him one of the most popular personalities on the platform. But why stop when the audience and advertising revenue are still growing? Why stop just months after being named GQ's 2016 New Media Star of the Year? Why stop when you're so popular that you get to film the Oscars in 360, fly in zero gravity, illegally wakeboard in Amsterdam and snowboard with the NYPD? Why? Because in Neistat's mind, there's nothing left to say via the medium he helped make famous (and that helped make him famous)—vlogging. To be clear, and as Neistat notes in his farewell vlog, he's not giving up YouTube altogether. Instead, he's turning his focus to bigger, longer and more ambitious projects. After all, when it takes 16 hours a day to plan, shoot, edit and post 10-minute videos day after day that are known for their adventure and authenticity, it doesn't leave much room for other endeavors. "I think of it as an orange—you squeeze that opportunity until there's no juice left," Neistat told Adweek in an interview at his studio a day before he recorded the last episode. "And the dangerous part is when you don't move on when there's no juice left, it's like moving laterally instead of moving vertically. I think from a career perspective, you should only move vertically." Last week, before filming the final episode, Neistat likened the vlog to a rocket ship. It's going up and up and up. Earlier this year, he had 4 million subscribers, and now he's at 5.8 million. But his own interest has lost its boosters. "I think the typical lifespan of most YouTubers is that they find a degree of success, and once they find that success, they stop innovating creatively because there's a fear that if you change what you're doing, the audience is going to stop watching," he said. He added: "The safest thing I can do right now is to do exactly what I'm doing right now. … That's what is scary about YouTube is that once you find success, there's a temptation to not change anything creatively because you don't want to jeopardize that success. But what happens over time is that people start getting sick of seeing the same thing over and over." So what's next? Even Neistat doesn't know for sure. In a way, it'll be Casey 3.0. The 35-year-old's first 15 years, or version 1.0, was learning to shoot and edit before moving on to branded content videos (before branded content was even a thing) and his own HBO show with his brother. The vlog was Casey 2.0. "When it's a daily consumption, the relationship is purely about my character and the audience," he said. "They're tuning in to see me every day. And it doesn't matter if I'm at the Oscars or at home with my family, they're tuning in to see me. And once I move away from daily and into something that looks more considered, more produced … a different kind of content, people will be tuning in to see the content versus just seeing me. That's something that I think will be a new challenge and something I'm looking forward to." Along with his own video projects, Neistat wants to find more opportunities to help his audience learn more about the world and how they can help make it better. He's already done this to some extent in the past, such as in 2013 when he used the $25,000 budget from 20th Century Fox to help with typhoon relief in the Philippines. He also wants to come up with a way to help the next generation of content creators use technology and find their voice. One of the things Neistat is most excited about is the democratization of tech. While other art forms like writing or painting have been largely affordable for decades, making videos hasn't necessarily been. Aspiring filmmakers needed at least a camera and a computer but now, smartphones are helping cut down on those costs. YouTube has created a way for anyone to have his or her own audience. "The dichotomy of YouTube from a creative perspective is that it incubates creativity in a way that no platform has ever incubated creativity before, because it enables anyone to build an audience," Neistat said. "Now anyone doing anything can build an audience." But it's not easy building a following. And while he's quick to mention the possibilities of creating content online, Neistat is also quick to mention something else: that nobody should start something if their main goal is to be famous—they should do it because they love it. "I was just as excited to make those first videos in a trailer park as I am now," he said.